We-Yu Su, left, and Minh Le took less than an hour to win the Kailua Men's Night Doubles title. Their third title was far less dramatic, but no less sweet for Minh Le and Wei-Yu Su. 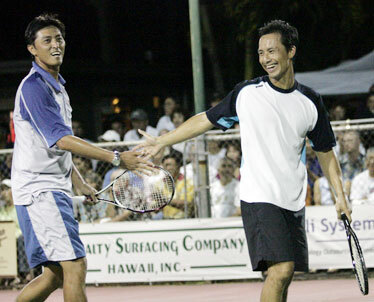 The last two years, Le and Su survived three-set battles with Mikael Maatta and Jan Axel Tribler in the Kailua Men's Night Doubles championship match. Last night, they made it a much shorter evening with a 6-2, 6-2 victory over Maatta and Tribler to capture their third straight title before an appreciative crowd at Kailua Racquet Club. "Winning the tournament here is an indescribable feeling with all the people who come out here and support you," Su said. A night after enduring a 3-hour semifinal epic against Michael Bruggemann and Erich Chen -- surviving four match points along the way -- Le and Su were on the court for less than hour in becoming the first team to string three consecutive titles since Peter Isaak and Kendall Char won the tournament from 1982 to 1984. Though the match tested their nerves and endurance, the semifinal appeared to sharpen Le and Su for the final. "We probably weren't even supposed to be here. It was a wake-up call," said Le, who will split the $3,000 first prize with Su. "The last two years we played these guys and every time it's been really close. We got off to a slow start, we got back on track and from there we turned it up." The match opened with Tribler and Maatta breaking Su's serve to take an early lead. But Le and Su answered back with a break in the next game and added another to go up, 4-2, and take control of the first set. "In tennis it's all about momentum swings," Le said. "We cut them off right there. ... We said let's ride this out a little bit. That was key, that second game was key." Le and Su went up a break early in the second set to lead, 3-1, and seemed to have an answer for everything Maatta and Tribler threw at them; Su even pulled off a behind-the-back, between-the-legs shot at the net in a stirring rally in the second set. "That threw me off. I thought the point was over, I had my hands down. That was incredible," Le said of his partner's shot. "When things like that go in then you know you're in for a good ride." For his part, Le lost just three points on his serve in the match, none in the second set. "We let it slip away very early," Tribler said. "We never got into the match." Tribler and Maatta vowed to give it another shot next year. So, will Le and Su return for a shot at an unprecedented fourth consecutive crown? Earlier in the evening, Ikaika Jobe and Bryan Wooten claimed third place with an 8-5 win over Bruggemann and Chen. Bradley Lum-Tucker, who teamed with Jobe to capture the 2004 title, was presented the Peter Isaak Sportsmanship Award. Mikey Lim, Thomas Shubert and Torin Ching shared the Sam Caldwell Amateur Athlete Award.